The fungus Cladosporium sphaerospermum can harness dangerous radiation to grow. Fungi couldeat dangerous radiation to survive, an unexpected finding that could one dayhelp feed astronauts in space. Or at least astronauts willing to eat acrawling fungus. Theresearch began with the discovery of black fungus growing on the walls of Chernobyl's damaged,highly radioactive nuclear reactor and collected by robots. The fungus was richwith melanin, the same pigment that gives human skin its color, protecting theskin from solar and ultraviolet radiation. Melanin is found in many, if notmost, fungal species. "The fungal kingdom comprises more species than any other plant oranimal kingdom," said researcher Arturo Casadevall,an immunologist at the Albert Einstein College of Medicine in New York. Nuclearand other high-energy reactions give off ionizing radiation – dangerous rays andparticles that can damage genes and thus cause mutations and eventually cancer.The researchers speculated that "just as the pigment chlorophyll convertssunlight into chemical energy that allows green plants to live and grow,"so might melanin help fungi make use of ionizing radiation, said nuclearmedicine specialist Ekaterina Dadachova at the AlbertEinstein College of Medicine. The scientists experimented on three species of fungi. They consistentlyfound that ionizing radiation significantly boosted the growth of fungi thatcontained melanin. "In general we think of radiation as something bad or harmful. Herewe have a situation where these fungi appear to benefit, which is unexpected,"Casadevall told LiveScience. 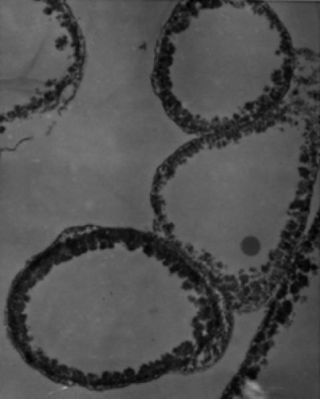 For example, the researchers exposed two kinds of fungi – one thatnaturally contained melanin (Wangiella dermatitidis) and another that scientists induced tomake the pigment (Crytococcus neoformans) – tolevels of ionizing radiation about 500 times higher than normal, the doses onemight see at high altitudes. Both species grew significantly faster, findingsdetailed in the May 23 issue of the journal PLoS ONE. The researchers stressed these findings do not mean fungi can eatradioactive matter and somehow cleanse it. Rather, the fungi can simply harnessthe energy that radioactive materials give off. The ability of fungi to live off ionizing radiation could prove usefulto people. "Sinceionizing radiation is prevalent in outer space, astronauts might be able torely on fungi as an inexhaustible foodsource on long missions or for colonizing other planets," Dadachova said. Casadevall alsonoted that the melanin in fungi is no different chemically from the melanin inhuman skin. "It's pure speculation – but not outside the realm ofpossibility – that melanin could be providing energy to skin cells," hesaid. "While it wouldn't be enough energy to fuel a run on the beach,maybe it could help you to open an eyelid." They Thrive in the Arctic, Why Not On Mars?